Greek wines at the Mezés wine bar. Photo from the Mezés website. Twenty years in business is something to celebrate, so join ~PLUMPJACK WINES &AMP; SPIRITS~ at their flagship store in the Marina to celebrate the milestone on Saturday October 20th from 2pm-6pm. They will be hosting their first-ever wine tasting, featuring their favorite wines. And the best part? It’s gratis. You’ll also be able to score some eats from Wexler’s Back barbecue truck and the Crème Brûlée Cart. 3201 Fillmore St. at Greenwich, 415-346-9870. More free wine in the Marina! ~MEZÉS~ Greek restaurant is now featuring free wine tastings Mon-Fri from 5pm-6:30pm and Sat-Sun from 1pm-3pm. 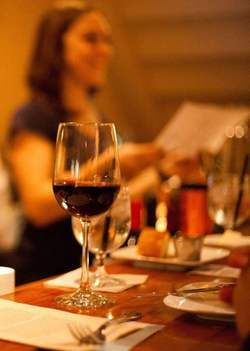 The pours focus on Greek varietals and wines, as well as some local producers. You can order their food at the wine bar, too, so bring a friend and try out some of their Greek small plates. 2373 Chestnut St. at Divisadero, 415-409-7111. On Wednesday October 24th, head to ~HARRY DENTON’S STARLIGHT ROOM~ for a night with Dale DeGroff, bartender and author of The Craft of the Cocktail. The evening is billed as a “Tribute to Bars, Speaks, and Legendary Saloons,” and DeGroff will be telling stories and sharing sage knowledge about the history of cocktails in America. The Starlight Room will be providing cocktails and hors d’oeuvres, and proceeds will benefit The Museum of the American Cocktail. The event begins at 6:30pm, and tickets are $40 in advance, or $45 at the door. Sir Francis Drake Hotel, 21st floor, 450 Powell St. at Sutter, 415-395-8595. The signage at Soda Popinski’s. Photo from Facebook. As previously mentioned on tablehopper, the former ~GOLD STAR BAR~ on Polk has been taken over by Duncan Ley and Benjamin Bleiman of Bullitt, Tonic, Lightning, and Mayhem. 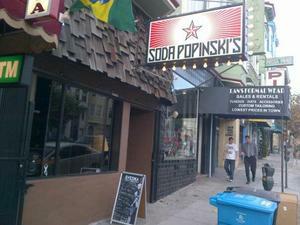 Grub Street has the news that the new spot, ~SODA POPINSKI’S~, is now open. The name apparently comes from a Russian character in Nintendo’s Mike Tyson’s Punch-Out!! Accordingly, you can play video games there for free, or just get a drink if that’s not your thing. 1548 California St. at Polk, 415-857-1548.